Rubbing Honest Abe’s nose in Springfield is sure to bring good luck – but even shining the schnoz of any statue three times a day can’t guarantee enough luck to prevent a car accident! We understand that it takes more than luck to land an honest deal on a good car insurance policy. With a little research, you, too, will have the opportunity to earn the fruits of your labor. Conjure your inner Abe and review our comprehensive guide on all things auto insurance. We include Illinois coverage and rates, car insurance providers, state laws, and so much more. You may already know comparing car insurance rates is a great way to save money! Start today with just your zip code. Before you decide to move to Illinois or even just visit, consider your options in car insurance coverage. Liability insurance pays all individuals — drivers, passengers, pedestrians, bicyclists, etc — who are owed compensation for property damage and/or injuries resulting from a car accident that you or anyone under your policy causes. Illinois is an “at-fault” accident state. This means, if you are the at-fault driver during an accident, you will be held liable for any personal injury or property claims. Illinois also requires all motorists to carry uninsured/underinsured coverage. Illinois has a mandatory insurance law. Signing your vehicle registration form is your promise to the state of Illinois that your car will be insured during the entire registration period. Without question, you must carry your insurance card at all times and present it to law enforcement upon request. The state of Illinois randomly selects drivers to verify minimum car insurance requirements. If selected, you’ll receive a letter, and you are required by law to provide verification of your coverage within 30 days. In 2014, the annual per capita disposable personal income in Illinois was $$42,256. That’s not bad considering that almost half of the states have a DPI lower than $40K. Disposable personal income (DPI) is the total amount of money available for an individual to spend (or save) after their taxes have been paid. On top of the stellar DPI, the average annual cost of car insurance in Illinois is only $854 which is only two percent of the average disposable personal income. The average Illinois resident has $3,521 each month to buy food, pay bills, etc. The car insurance bill will deduct about $71 out of that. Despite the higher income, Illinois residents pay pretty reasonable rates for car insurance. Now, you can put those extra dollars where it really matters – savings! American Consumer Credit Counseling suggests saving 20 percent of every paycheck. With Illinois’ DPI, that’s $704 each month! How much are you putting aside for savings? The above table outlines what the experts say. Expect car insurance rates in Illinois to be significantly higher for 2019 and on. Remember: Illinois has a mandatory insurance law for liability coverage and uninsured motorists coverage, but experts suggest drivers purchase more than what state law requires, especially when the state is an “at-fault” state like Illinois is. Let’s explore some of the most popular coverage options to add to a basic auto insurance policy. A loss ratio shows how much a company spends on claims to how much money they take in on premiums. For example, a loss ratio of 60 percent indicates that companies are spending $60 on claims out of every $100 earned in premiums. A loss ratio of over 100 percent means the company is losing money. If the loss ratio is too low, the company isn’t paying claims. With loss ratios dropping, it is evident that Illinois residents are taking some advantage of valuable extras, but not quite as much as they should. In 2015, 13 percent of motorists in the US were uninsured, and 13.7 percent of motorists in Illinois, ranking 18th in the nation. Luckily, car insurance companies in Illinois are looking out for you! Every liability car insurance policy automatically includes uninsured motorist coverage (UIM) with limits EQUAL to the policy’s injury liability coverage. The State of Illinois expects drivers to cover themselves just as much as they cover others. Meaning, the more liability coverage you purchase, the more you are protected if hit by one of the nearly 5.5 million uninsured motorists driving around the state. An alternative is to consider personal injury protection (PIP), otherwise known as no-fault insurance, for medical bills incurred because of a wreck, regardless of who is at fault, who is driving, or who owns the vehicle. Cover your own back! Start comparison shopping today using our FREE online tool. Enter your zip code below to get started! We know getting the complete coverage you need for an affordable price is your goal. Good news: there are lots of powerful but cheap extras you can add to your policy. Here’s a list of other useful coverage available to you in Illinois. Most people are under the impression that men pay higher car insurance rates than women. That is typically the case in the state of Illinois with a few instances otherwise. Our researchers came to a surprising conclusion. They learned that age and the actual insurance carrier seem to be the most significant contributing factors in cost variance. Case in point, Illinois Farmers Insurance charges 17-year-olds over $8,200 more than their average of $2,522 yearly premiums for insured individuals over the age of 18! USAA, however, charges only about $3,200 difference in annual premiums based on age. Search the table below which lists the highest and lowest rates according to the zip code. Take a look at the table below listing the most/least expensive carrier rates according to the city. Use the search box to look for various cities. As you can see, your location is a significant factor in the rates you can expect to pay. There are so many car insurance carriers vying for your business these days, it’s hard to know which ones actually come through on their promises. No need to worry, we’ve got you covered! Keep scrolling to find out who the 10 best providers are across the state. AM Best gives insurance companies financial ratings. A good score means they are highly likely to stay solvent and have the ability to pay customer claims. Besides premiums, one of the other components that should factor into your decision when picking an insurance carrier is customer ratings. Want to find out what customers really think about the top Illinois car insurance carriers? Illinois falls into the North Central Region for the 2018 J.D. Power auto insurance study. The top insurances companies of Illinois are sprinkled throughout the customer satisfaction ratings provided by this trusted source. Weigh the good against the bad by looking at complaints as well as accolades. The complaint index of each company calculates how much larger a company’s share of complaints is compared to its share of profits across the state. Companies that have a complaint index higher than one are worse than the average insurer in Illinois, and those with an index below one are better than average. Bear in mind, some complaints are based on general customer satisfaction, so factor that into your final decision. We know that rates are one of the biggest factors that impact your choices in Illinois car insurance. The below chart shows ten of the top carriers in the state, along with their average rates compared to the overall state average. Our researchers discovered that Allstate charges the most in average premiums, with Ilinois Farmers Insurance coming in at 2nd place for the highest annual rates. Meanwhile, Safeco comes in number one for the lowest average rates. The table below compares the rates of top carriers in the state against average commute times. 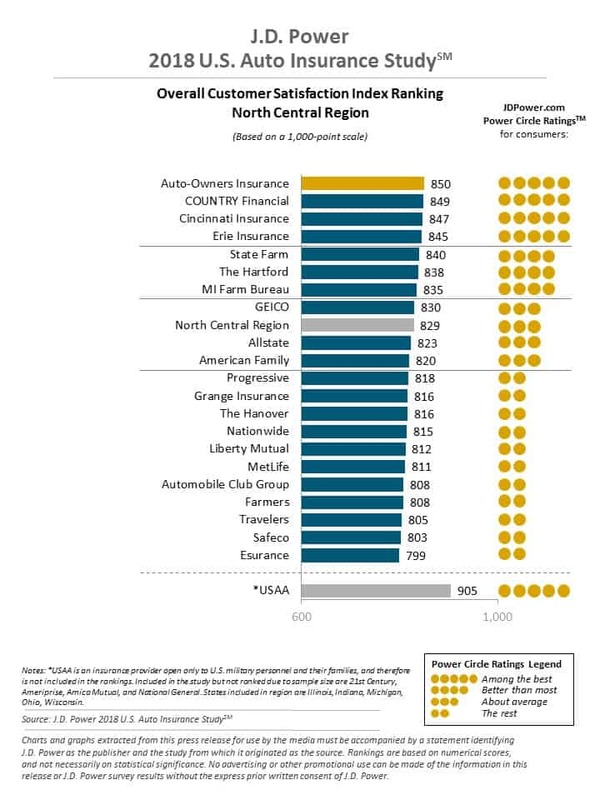 Interestingly enough, Allstate comes out with the highest premium for annual mileage while Liberty Mutual and USAA compete for the lowest premium for annual mileage. Think of your needed coverage level as a way to equalize your assets in the event you are taken to court regarding an at-fault car accident. An example of the amount of liability at a low coverage rate would be 50/100/50, medium level coverage would be 100/300/100, and high coverage would be 250/500/100. Low, medium, and high coverage level rates for the top ten insurance providers in Illinois are listed in the table below. These rates are averaged across all zip codes. As you can see, on average, it doesn’t cost much more per year to get medium ($14 more per month) or even high-level coverage ($27 more per month). For some insurance companies, the difference between low and high coverage is much lower than the average. According to a study conducted by Experian, the average resident of Illinois has a credit card VantageScore of 683 and around 3.14 credit cards in their name. The average Illinois consumer has a credit card balance of $6,410. If you think that your credit card debt and car insurance rates have no correlation, think again. Insurance carriers run credit checks on their insureds to assess the likelihood of them filing a claim at any point. If your credit score doesn’t meet their standards, you might just see a spike in your rates regardless if you’ve had an accident or not. As you’ll see in the table below, your driving history has a direct effect on the premiums you can expect to pay. If you look at the rates listed for American Family, for example, you’ll notice that the rate difference for a clean record versus one DUI is nearly $2,500 premium jump, while State Farm increases by as little as $200 from a clean driving record to having one DUI. In the table below are the 10 insurance companies in Illinois that are at the top of the market share. A loss ratio shows how much a company spends on claims to how much money they take in on premiums. With so many options, let us help navigate your decision. In order to keep your car insurance rates low, you have to know the laws in your state so you’re not blindsided by a fine. Don’t worry! We’re here to help. Keep reading to learn about the laws specific to the state of Illinois. Car insurance laws will be different in various states, but Illinois keeps things fairly standard. For drivers with a history of accidents or traffic violations, they may find themselves unable to purchase coverage from an auto insurance carrier. This is where a type of insurance known as high-risk insurance comes into play. If you are having trouble finding a car insurance carrier, you may apply for insurance through the Illinois Automobile Insurance Plan (ILAIP). You must verify that you have tried and failed to get reasonable rates within 60 days of serving your sentence. The state of Illinois currently does not provide any special low-cost insurance programs. Illinois law requires drivers to carry a minimum amount of liability insurance. Penalties for not having insurance can be severe. You can’t afford not to have insurance. While some states mandate a waived deductible for windshield repairs, and others specify the use of only manufacturer replacement parts, Illinois does permit replacement with aftermarket parts with written notice; however, you may refuse, but you will pay the difference in the quote. There is not a law that mandates insurance companies in Illinois to offer a zero deductible with comprehensive coverage, but it is an option. If windshield coverage is something you desire, you will need to have comprehensive coverage and you will have to carefully examine how the different insurance providers handle windshield claims. Insurance fraud is a criminal offense in the state of Illinois, occurring when an individual attempts to deceive an insurer to receive benefits or payouts they are not qualified to obtain. Intending to deprive an insurance company or self-insured entity permanently of the use and benefit of that property. The state of Illinois has a fraud bureau, but it does not apply to automobile insurance. Simply put, don’t commit insurance fraud, and you’re good to go. A statute of limitations is the limit on the amount of time you have to bring a lawsuit to court. Different states have different statutes of limitations for personal injury and property damage matters. If you are ever in an auto accident involving extensive injuries and damages, you need to know your rights in the matter. 735 Illinois Compiled Statutes section 5/13-202 explains that you have to get your personal injury lawsuit filed within two years of the date of the car accident. However, according to 735 ILCS 5/13-209, if the accident results in the death of a person, a wrongful death lawsuit must be filed within one year of the date of the deceased person’s death or within the otherwise two-year limit, whichever is later. Illinois law 735 ILCS 13-205 gives you five years to file a property damage suit. Now, we all know that you can’t drive a car without a license. Let’s find out what mandatory vehicle licensing laws are in Illinois. Learner's Permit: 15 years first 12 months—no more than 1 passenger younger than 20 (family member exception) starts 10 p.m. Sun.-Thur., 11 p.m. Fri.-Sat., ends 6 a.m.
Full License 16 years None. None. In Illinois, enrollment in the Graduated Driver Licensing (GDL) program is required to help teen drivers gradually get more comfortable driving. The program has been in effect since 2008. In fact, Illinois has cut teen driving deaths in half since beginning the GDL, from 155 teen deaths in 2007 to 76 in 2017. In the first year of the program alone, the death rate was reduced by 67 percent. In addition, any 18-20 year old who did not take driver’s education in school (new residents, for example) must complete a 6-hour adult driver education course. The Office of the Illinois Secretary of State handles all matters related to vehicle licensing. Visit a Secretary of State location, turn over all other state licenses, provide identification documents, and have your photo taken. Pass the vision screening, written and/or driving exams, and pay your fees. A 90-day, paper driver’s license will be provided, and expect the real deal in the mail within 15 business days. Drivers under the age of 21 must complete a six-hour adult driver education course before obtaining a driver’s license. In Ilinois, courts use a rule known as modified comparative negligence in the case if one driver is primarily at fault but the other driver is found to bear partial responsibility. Typically, blame is divided between the responsible parties based on the percentage of responsibility each has. The percentage of responsibility is then applied to the total cost of personal injury and property damage. If the blame assigned to the person claiming damages is less than that assigned to the other parties, the plaintiff is entitled to damages — reduced by the percentage for which the plaintiff is responsible. However, if the blame assigned to the plaintiff is greater than that assigned to the other party or parties, the plaintiff is not entitled to damages. Knowing the driving laws of Illinois is important to keep your insurance rates down. The first thing to know is that Illinois follows a traditional fault-based system when it comes to financial responsibility for losses stemming from a crash: that includes car accident injuries, lost income, vehicle damage, and so on. Illinois law states that you should use the left lane for only passing and turning left with five exceptions. Previous to January 1, 2017, the Move Over law – now known as “Scott’s Law,” only applied to emergency vehicles. Now the law applies to all vehicles with flashing lights to include commercial vehicles. “Scott’s Law” was named after Lieutenant Scott Gillen of the Chicago Fire Department who was struck and killed by an intoxicated driver while assisting at a crash on the Dan Ryan Expressway. The Willis Tower elevator has a need for speed going 18 mph to the 103rd floor, but Illinois keeps drivers at a safe speed of 55 mph on its urban interstates. Maximum posted speed limits are 70 mph on rural interstates, 65 mph on limited access roads, and 55 mph on all other roads. However, Cook, DuPage, Kane, Lake, Madison, McHenry, St. Clair, and Will Counties have enacted a local ordinance setting the maximum large truck speed limit of 60 mph outside of urban districts and 55 mph inside urban districts. Seat belt use in Illinois is primarily enforced and requires anyone in the front seat to be at least 8 years old with a fine of $25 if violated. 2019 child safety seat laws in Illinois require that children younger than 2 years old be in a rear-facing child restraint unless the child weighs 40 or more pounds or is 40 or more inches tall. Effective June 1, 2019, children seven years and younger will be required to be in a child safety seat. An adult belt is permissible for children 8-15 years old and over 40 pounds with no preference for the rear seat. Currently, there is not an Illinois state law that regulates transporting people in the cargo areas of pick-up trucks. Rideshare services like Uber and Lyft mandate that all their drivers carry personal car insurance policies that align or exceed the minimum coverages dictated by state law. Drivers rarely carry their own commercial insurance coverage; however, nine companies provide rideshare insurance in Illinois. Currently, Illinois is testing the various types of driving automation on public roads. State law requires that a licensed operator be in the vehicle and have liability coverage. But wait, there’s more! Let’s dig deeper into the safety laws in Illinois to protect you on the open road. 1st Offense-Other before driving privileges restored, must complete substance evaluation and treatment program +high-risk auo insurance for 3 years. Illinois DUI laws are strict compared to most states. The only other states more strict are South Carolina and Florida. Ilinois currently has a marijuana-specific impaired driving law that restricts blood toxicity levels to be no more than five nanograms of THC per se. The state of Illinois currently has tough laws regarding hand-held device usage, cellphone usage, and texting. Illinois has an all driver ban on any handheld device. They even clarify no blue-tooth conversations for those under 19 with an “all cell phone ban” …and it is primarily enforced. Lawmakers keep it simple. It’s “10 and 2” for you, Illinois residents! Primary enforcement means that you don’t have to be pulled over for anything else to get a citation for using any type of communication device. Maybe Illinois lawmakers saw this video made by two entertaining scientists that put our assumptions about safe driving to the test. The Mythbusters always know what’s empirically best! Do you want to know how safe it really is for drivers in Illinois? Well, the data our researchers found might surprise you. In 2016, there were just over 18,209 motor vehicle thefts in the state of Illinois. Sixty-three percent of these thefts were in Chicago alone! Here are the top-10 stolen cars in Illinois. The best way to stay safe while driving is to always keep your eyes on the road and stay aware of common risky driving issues in your state. In 2017, there were 287 traffic incident-related fatalities in Cook County alone, comprising a 5.5 percent fatality rate per 100,000 of the population. If you live in Illinois, chances are you live in a household with one to three cars, drive alone to work, and spend at least 10-34 minutes of your day commuting! With an average commute time of 27.5 minutes and with over 73 percent of the population driving alone, that commute doesn’t exactly rank Illinois as the greenest option when it comes to carbon emissions. Some residents of Illinois (2.88 percent to be exact) even suffer through a “super commute” — spending in excess of 90 minutes in the car! Though only seven percent of Illinois residents actually live in Chicago, an even higher percent commute to the city for work. Add in all of the tourists, and you’ve got the 3rd most congested city in the United States. In 2018, each driver in Chicago spent 138 hours sitting in congestion which is $1,920 per driver. Now (thanks to us and good ol’ Abe), you are well equipped to exercise your personal economic and social freedom by considering your options in car insurance in the Prairie State! It’s very important to compare rates unique to you. Enter your zip code below to get started!